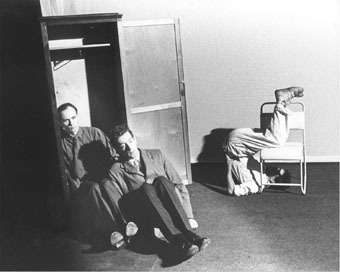 Homage to Morandi was created by The Theatre of Mistakes in 1979. The performers were Anthony Howell, Julian Maynard Smith and Peter Stickland. In the performance the metaphysics of Morandi's paintings of still lives is transferred to the scale of wardrobes, chairs and suitcases. These are moved through several furniture vignettes by the performers in Act 1. With each ensuing act these vignettes are repeated, with less and less furniture every time, the performers "standing in" for the furniture. For instance, in the photograph above it can be seen that Peter Stickland is standing in for a chair stacked on a chair. Anthont Howell and Julian Maynard Smith are two suitcases falling out of a wardrobe. Morandi was performed at Saint Martins School of Art and in Berlin, Amsterdam and Ferrara.